A special charity sailing challenge is back for 2019, after a successful first run in Annapolis last year. The Triple Crown Trophy of Charity Sailing combines three top sailing events: The Leukemia Cup, the CRAB Cup, and the Hospice Cup. Sailing crews are encouraged to participate in all three worthy causes, and the skipper who finishes highest in all three races— and raises the most funds for the three charities— wins the trophy. The trophy is presented by Eastport nautical instrument-maker Weems & Plath. It is on display at The Market House in Annapolis, where the competition will officially kick off at a reception on April 25. 2018 trophy winner John Heintz will be there, along with leaders from the three charities, answering questions. If you’d like to attend, please RSVP to sarah@crabsailing.org by April 22nd. The Leukemia Cup Regatta is June 1, 2019, and it raises money for the Leukemia & Lymphoma Society (LLS) in support of blood cancer patients. The CRAB Cup is on August 17, raising funds for Chesapeake Region Accessible Boating (CRAB)’s sailing programs for people with disabilities. The Hospice Cup is on September 14, and raises awareness and funds for hospice care programs around the region. 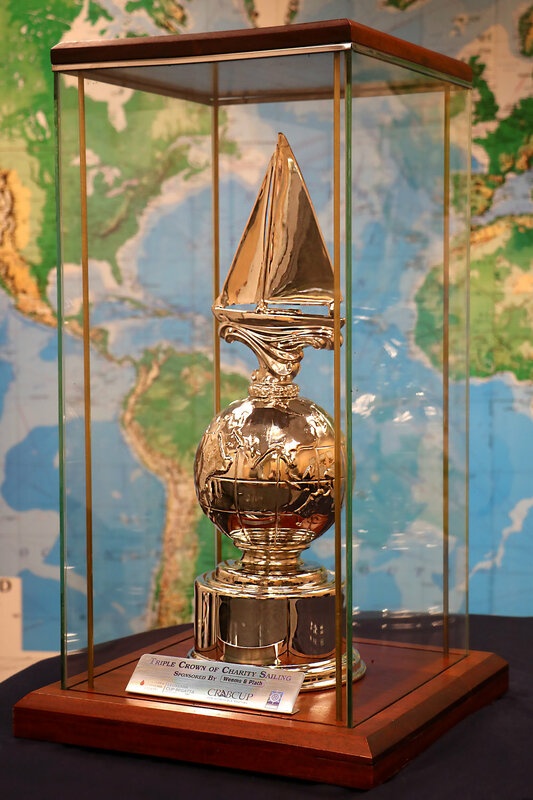 The Triple Crown of Sailing Trophy will be awarded in October.